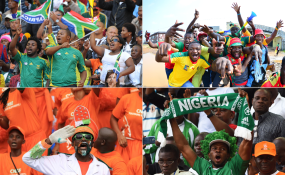 Cape Town — The full line-up for the 2019 Africa Cup of Nations has been completed, after the final fixtures on March 24. South Africa - Bafana Bafana secured the last spot in Egypt following a 2-1 win over Libya in Tunisia on March 24, 2019. Zimbabwe - The Warriors seal their place with a 2-0 win over Congo to finish top of Group G ahead of DR Congo. DR Congo - China-based Cedric Bakambu's goal on March 24 ensured DR Congo made it to Egypt instead of Liberia. Tanzania - The Taifa Stars beat rivals Uganda 3-0 in Dar es Salaam on Sunday to qualify for the Africa Cup of Nations for the first time since 1980. Cameroon - Defending champions, The Indomitable Lions sealed qualification on the final matchday after beating Comoros 3-0 in Yaounde on March 23. Madagascar - T he Barea secured qualification following a 1-0 home victory over Equatorial Guinea in early October. Burundi - The Swallows qualified for the African Cup of Nations finals for the first time after a 1-1 draw with Gabon on March 23. Tunisia - The Eagles of Carthage qualified after they finished top of Group J, two points above Egypt. Egypt - The host nation took part in the qualifiers and secured their spot after finishing second behind Tunisia. Senegal - The Lions of Teranga secured an early qualification with 1-0 victory over Sudan in Khartoum in October. Mauritania - The Lions of Chinguetti secured their first ever qualification with a 2-1 win over Botswana in November. Angola - The Giant sable antelopes clinched a place in Egypt with a 1-0 win over hosts Botswana on March 22 to finish top of Group I.
Côte d'Ivoire - The Elephants qualified after sharing the spoils with Guinea in Conakry in November. Nigeria - The Super Eagles needed a last-minute Moses Simon goal to seal a 3-1 home win over Seychelles in a to qualify as leaders of Group E.
Uganda - The Cranes sealed qualification with a 1-0 win over Cape Verde in November. Ghana - The Black Stars will be hoping to end their 37-year-wait for the title in Egypt after they qualified for their eighth straight tournament. Mali - The Eagles completed their campaign unbeaten. Guinea - The National Elephants finished top of Group H, one point above Ivory Coast. Kenya - The Harambee Stars finished second behind Ghana in the qualifiers. Namibia - The Brave Warriors, despite being thrashed 4-1 by Zambia in Lusaka, qualified in second place in Group K ahead of Mozambique on the head to head results between the two countries. Benin - The Squirrels battled past a Togo side led by former Real Madrid and Arsenal striker Emmanuel Adebayor to qualify for the first time since 2010. Guinea-Bissau - A dramatic stoppage-time equaliser from Frederic Mendy secured The Djurtus top place in Group K after a 2-2 draw at home to Mozambique. Algeria - The Desert Warriors topped Group D with 11 points to qualify for the finals. Morocco - Herve Renard's Atlas Lions booked their spot in the Afcon following 2-0 win over Cameroon in Casablanca in November.